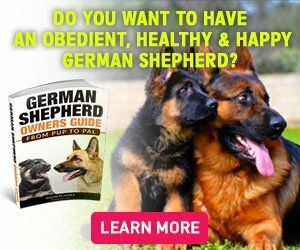 Where German Shepherds Get Their Loyalty From? Long Haired German Shepherd = Long Hair Problems? Nope. Chewing is a habit that every dog has as it starts to learn about the environment it lives in. It is alright to let your GSD chew on its toys, but it becomes a problem when it begins to chew on your personal items like your shoes, underwear, pillows, and much more. When Does the Chewing Start? 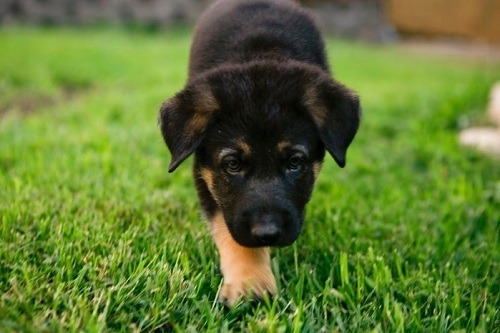 A GSD starts to chew at the age of three to eight weeks. This is the time when your GSD puppy is developing teeth, a process known as teething. During the teething period, a GSD pup will chew on almost anything that it finds. This behavior is a result of extreme gum pain that is eased off when the puppy applies pressure with its gums. Biting on things with excessive force will numb the gums which will not cause irritating pain. How to Stop My Pup from Chewing on My Stuff? Many owners make a mistake of letting their pup chew on things during its teething. What happens when you encourage this behavior? A GSD pup will look absolutely adorable chewing on its toys and other items, and it is almost natural for its owners to let it enjoy. However, if the puppy is not stopped, it will adopt chewing as a habit. So, how do you stop your puppy from chewing on things? How do you differentiate between good or bad chewing? Let’s find out the solution below. If your puppy likes to chew on everything that it finds on the ground, then this is a problem that should be addressed immediately. Make sure you do not scold your pup as it will trigger its destructive behavior and due to its dominant nature, it will ignore your commands. If it’s chewing on its toys, it’s acceptable. However, if you find your GSD pup chewing on your personal items, react right away. You can make this behavior stop by encouraging it to chew on its toys. Offer your GSD a soft chewable toy (the one that is filled with water) when it mouths one of your shoes. If your pup accepts its toy and leaves your shoe, offer it a treat or some cuddles. This way your pup will know that chewing a toy is right. Similarly, when your pup starts to chew on your items say ‘No’ or ‘Leave it’ or ‘Stop’ in an authoritative tone. You can also push your pup backward using one hand so that it knows that this behavior is not acceptable. This is the basic way of letting your dog differentiate between right and wrong. Another way of making abrupt chewing stop is to buy a lot of chewing toys. 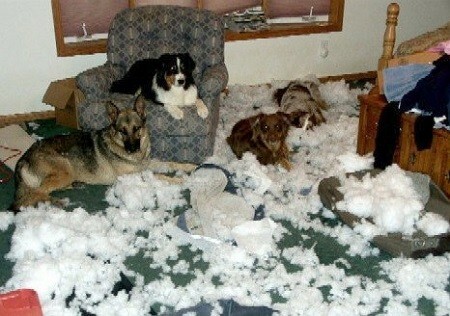 When your dog has plenty of its things to chew on, it will less likely be destructing your things. The chewing toys you choose for your puppy should be non-destructible, non-toxic, and non-swallowable. If your GSD pup is an aggressive chewer, make sure you buy both, hard and soft toys for it. The toys that are filled with water are good for less aggressive chewers. Make sure you do not over-pamper your pup by providing it with more chewing options. Another strategy, rather an evil one is to spray your items with an anti-chew spray. These sprays are readily available at pet shops and big stores. Anti-chew sprays are made with natural ingredients that are harmless to your pup. The taste of these sprays is bitter which irritates the puppy and keeps it away from chewing on things. The thing that ruins a GSD pup most is the love that it gets from its owner. Many GSD owners get too excited when they buy a puppy. Instead of becoming the pack leader by training their dog, they become overly affectionate and loving towards their pup. This behavior of owners often ruins a dog, and it starts to see itself as your friend (assumes that it is equal to its owner). When a GSD pup sees you as a friend, it begins to chew on things and do whatever it feels like. The dog knows that you are its friend, and a friend cannot scold you or become your leader. Such puppies begin to chew on their owner’s feet and hands. This behavior gets out-of-control when the pup grows into a big sized dog. To avoid this behavior of your dog, you need to start training it at an early age. Set yourself as the pack leader and know when to say ‘No.’ Do not run to your dog when you return from work or wake up in the morning. Stay calm and composed when dealing with your dog and avoid behavior problems like chewing and mouthing. Before bringing a GSD pup home, make sure you have done your homework. Puppy-proofing means that you set your home in such a way that your puppy stays safe in it. You will need to remove toxic substances from the reach of your pup, get rid of anything that could be harmful to your pup, remove pointy, sharp, and slippery furniture or items from home, repair broken wires or open sockets, etc. Moreover, remove small items from the reach of your pup that will be appealing to it including shoes, socks, cushions, etc. Many GSD pups chew on things when they are bored. So, make sure you are giving your puppy enough time to exercise and enjoy with you so that it doesn’t need to chew on things. When you play with a puppy, it will get tired after a few minutes and fall asleep. This is the perfect way to abstain the puppy from chewing. A GSD with bad chewing habits will sooner or later irritate you. That’s why it is advised that owners provide appropriate chewing toys to their puppies for their entertainment. If you want to know more about a GSD’s behavior, make sure you sign-up on our newsletter.